Home » Romantic fashion in the Reign of Philippe. 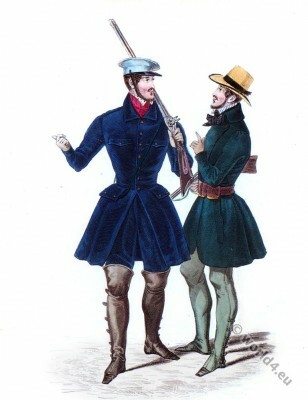 1830 to 1848. Microscopical bonnets. Variety of caps. The stage — Historic costumes. Influence of Rachel, the actress. Colors — Various designations of materials — Bedouin sleeves. 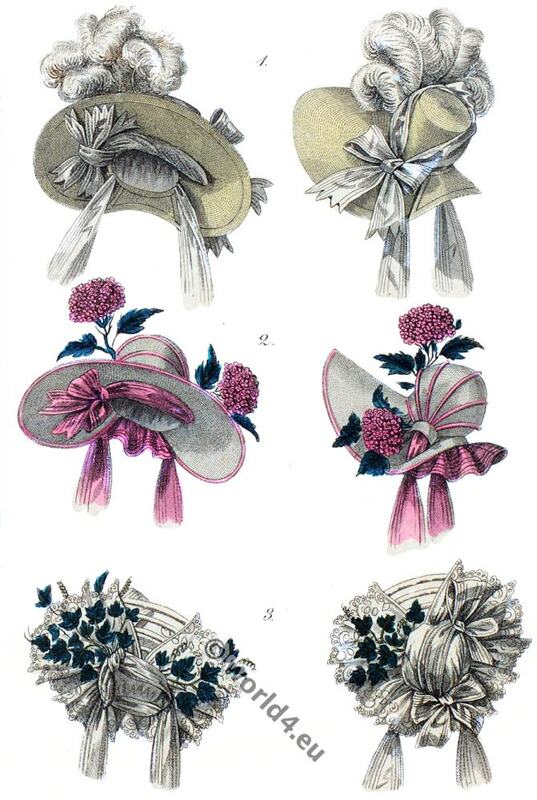 Bonnets and head-dresses — Pamela bonnets. The Revolution of July 1830 did not produce nearly so much effect on dress as that of 1789. In the reign of Louis-Philippe I. (1773 – 1850), as in that of Charles X., feminine costume changed but little. 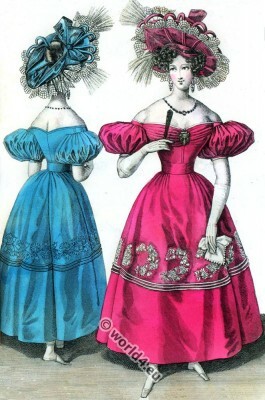 Fanciful adjuncts of dress succeeded one another without interruption, but the basis of dress in general remained the same. 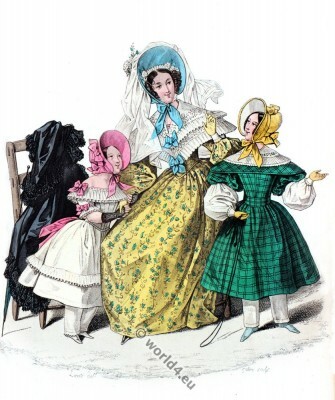 Microscopical “bibs” took the place of the enormous bonnets that under the name of “cabriolets” had been the delight of Parisian ladies in 1835; and dress-caps were manufactured in a variety of shapes, and under a variety of names, viz. 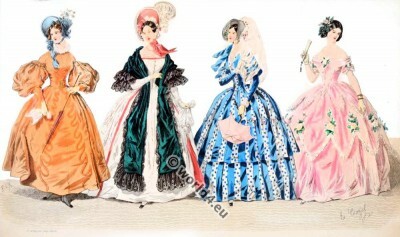 the Charlotte Corday, the peasant, the nun, the Elizabeth, the chatelaine, the Marie Antoinette, the polka, &c.
The greatest novelty consisted in the colours chosen for dress. 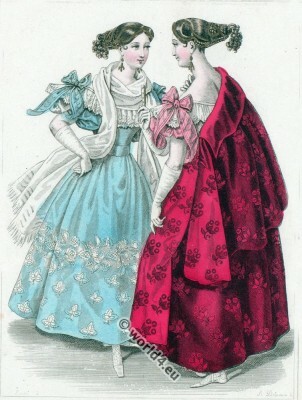 The “Snow” head-dress was named after Auber’s work; gowns “à la Dame Blanche,” after that of Boieldieu; and caps “à la Fiancée,” also after Auber. 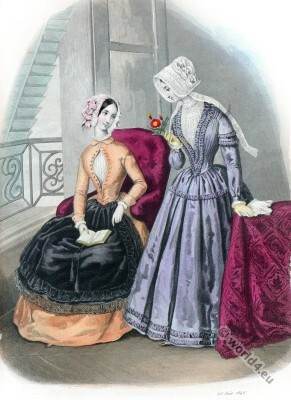 To these succeeded various colours, called “Solitaire,” from Carafa, or the ” Petites Danaïdes,” and “Robin des Bois.” Dark and sober tints were worn in preference to brighter hues, for no other reason than the romantic ideas of a period in which both men and women delighted in appearing melancholy, Byronic, and sickly. The effect of the Romantic School on Fashion may be easily imagined. The early works of Victor Hugo and Lamartine had kindled the popular imagination, while Scott’s novels and Byron’s poems had everywhere fostered ideal sentiments. 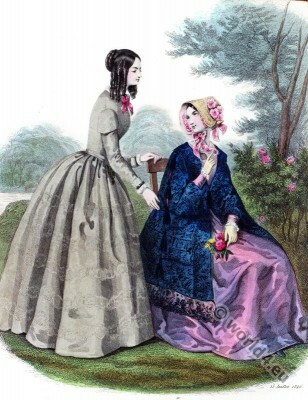 Reveries, suffering, sacrifice, and boundless self-devotion were the themes of the day, and fair ladies voluntarily shed tears, because to weep was fashionable. Costume de Cheval. 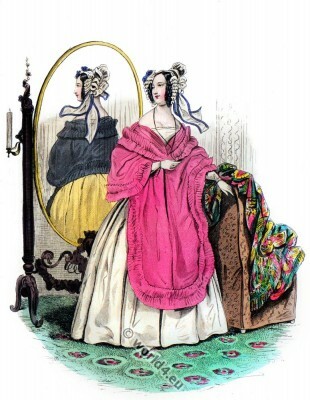 La Mode 1836. The return to the Middle Ages was likewise manifested by numerous costumes taken from the periods of which we treated at the beginning of this history. Who is that lady? Is she the Le Châtelain de Coucy? She wears a long train, an enormous pearl necklace, and hanging sleeves like those of Marguerite of Burgundy; the alms-bag suspended from her waist, and her carved jewellery, make her resemble a woman of the fourteenth century. Not so, however. She is the wife of a rich shopkeeper, and has been present at the performances of plays by Victor Hugo and Alexandre Dumas. 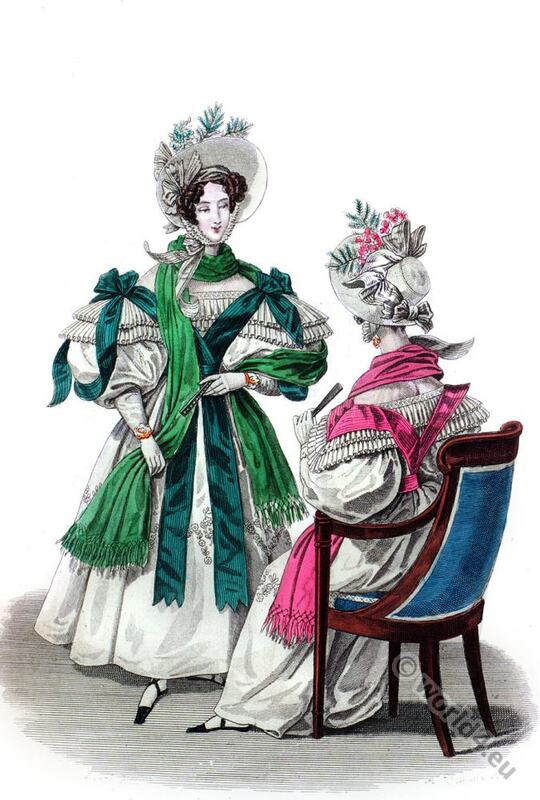 Not only the public resorts of Longchamps and the Tuilleries, but the French and Italian Opera Houses, the Opera Comique, the Théâtre-Français, and the large theatres of the Boulevards exercise the greatest influence at the present day over the caprices of Fashion. 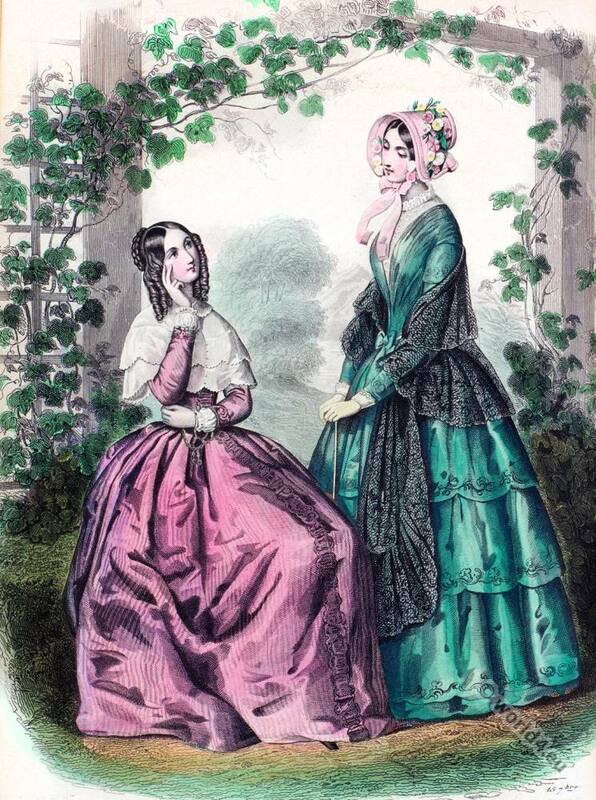 An extraordinary discrepancy exists between the character of women and the garments they choose to wear. A sweet and gentle girl has her hair dressed like that of the infanticide Norma, and the best of mothers seeks to imitate the costume of that arch-poisoner, the Marquise de Brinvilliers. 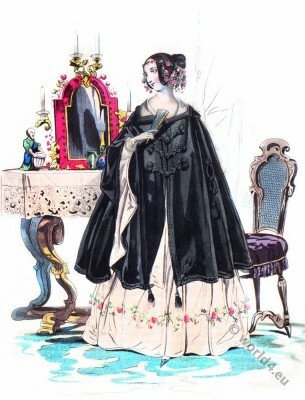 Masked and fancy-dress balls were crowded with historical characters, from Frédégonde to Mary Stuart, and from Catherine de Médicis to Charlotte Corday. The Greek and Roman styles were replaced by those of the Middle Ages and the Renaissance. Meanwhile the great actress, Rachel, revived the ancient tragedies. She played successively Emilia, Hermione, Eriphyla, Monima, Electra, Roxana, Paulina, Agrippina, and Phædra, and by her genius gave new life to masterpieces that had been almost forgotten, if not despised, since Talma ceased to interpret them. Thereupon the ladies of the Faubourg St. Germain and those of the Chaussée d’Antin became fired with enthusiasm; not only did they invite Rachel to their salons, where she recited the imprecation of Camilla or the dream of Athalia, but they copied the dress of the illustrious tragedian. If Rachel wore a bracelet of artistic design, other ladies immediately tried to procure similar ornaments; or if on another occasion she displayed a set of magnificent cameos, they too must possess cameos of the same kind. They copied the great actress in the minutest detail of her costume, and even in her most characteristic head-dress. 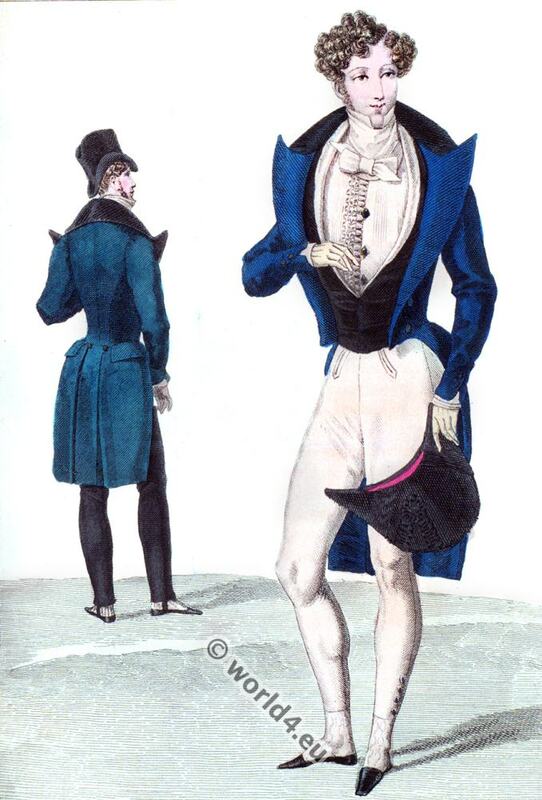 The Romantic School was succeeded by that of “good sense,” according to the admirers of Ponsard; and Emile Augier’s “Ciguë” produced a temporary revival of the taste for Greek and Roman fashions. But the reaction against the Middle Ages did not reach the “bourgeois” classes, who, when their “romanticist” costumes were worn out, replaced them with others of a less striking style, and better adapted to modern life. And by how many extraordinary designations were the new materials known! How charming was that of pou de sire, or pou de la rein(Silk louse. Queen’s louse.)! 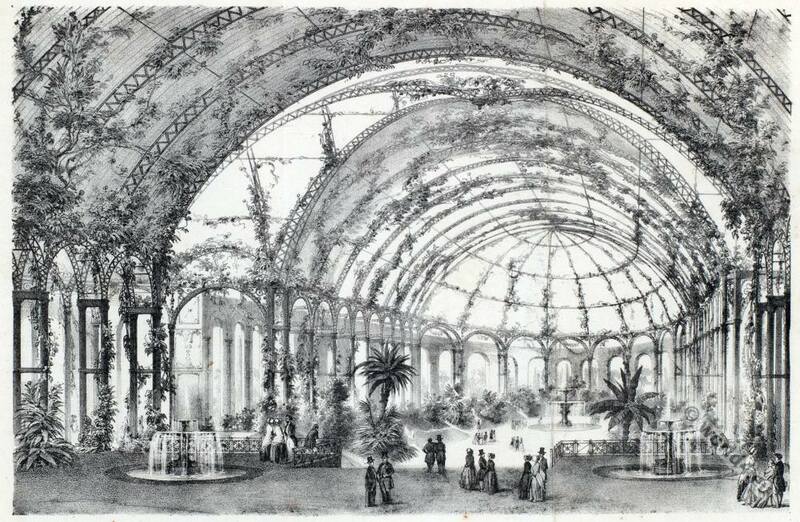 New View of Winter Garden at Champs-Elysées 1846. 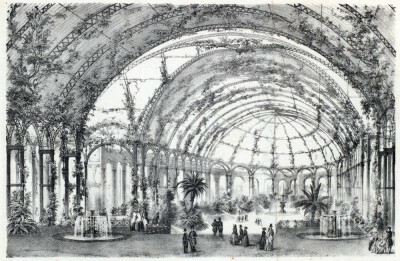 Vue de Nouveau Jardin d’Hiver. Suivant le plan adopte par l’assemblée générale des Actionnaires de la Compagnie immobilière des Champs-Elysées, et qui est en voie d’exécution. Never had there been such a variety of nomenclature! The most wonderful appellations were bestowed either by the manufacturers or the vendors of the new materials, and the public seriously accepted and made use of the pretentious newly-invented words, at which sensible people could but smile. We are omitting to mention the tricolor materials, that made a momentary appearance from time to time, when patriotism happened to be awakened by some victory over the tribes of Algeria. Besides poetical names, there were others less agreeable, but accepted universally nevertheless. 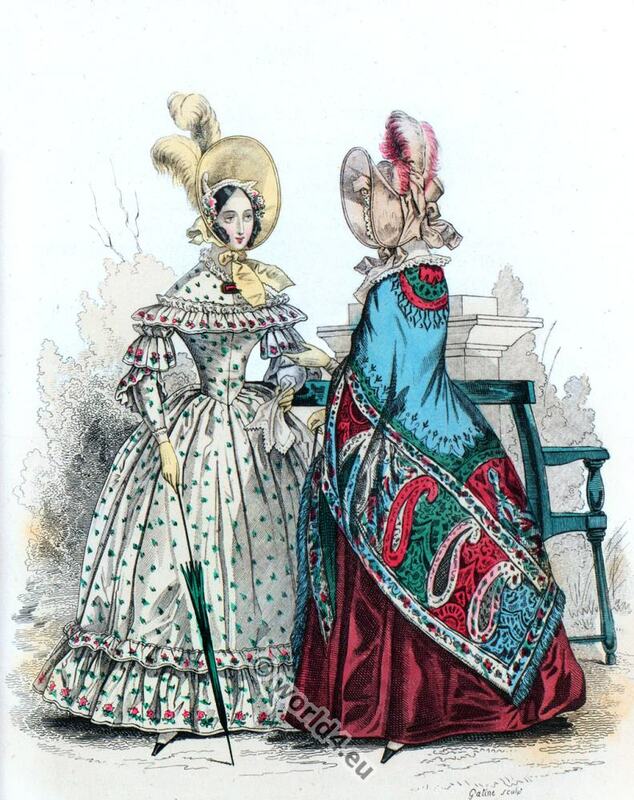 It sounded odd to compliment a lady on her Bedouin sleeves, or her busked or loosely-laced bodice! Head coverings underwent singular changes. The “bibi” was suddenly transformed into the “cabas,” with a deep crown concealing the neck; and the next season brought in Pamela bonnets, with rounded brims, that very prettily revealed the outlines of the cheeks. The hair was, generally speaking, arranged in curls on each side, and in large rolls held by a comb at the back of the head. Almost all family portraits of that date represent the hair arranged thus, and adorned either with feathers or more frequently with artificial flowers, such as are still worn. Great perfection had been attained in the manufacture of roses, geraniums, nympheas, chrysanthemums, camelias, and many other lovely flowers, to enliven the attire of women. 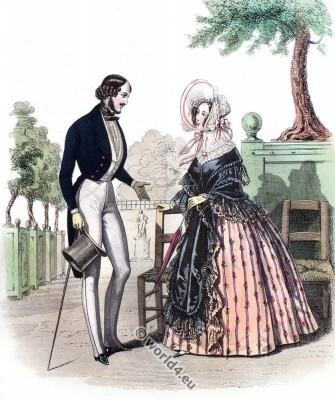 The most fashionable style of dress in 1830 was as follows:— Gowns either high or low, with or without capes; long sleeves with wristbands, or short sleeves and long gloves; bodice with or without a waistband, and generally worn with an embroidered collar; scarf and parasol of some dark tint; black prunella or Turkish satin shoes; no trimmings to the gown, but red or flame-colored ribbon bows scattered here and there; and necklaces composed of two rows of pearls. But we must not imagine that this was all, and that capriciousness and the love of change can ever abdicate their throne. The “leg-of-mutton,” the “berêt,” the “imbecile,” and the “elephant” sleeves were succeeded by others not quite so eccentric, but still, for the most part, sufficiently extraordinary. It would be an endless task to enumerate the slight but very various developments of fashion. 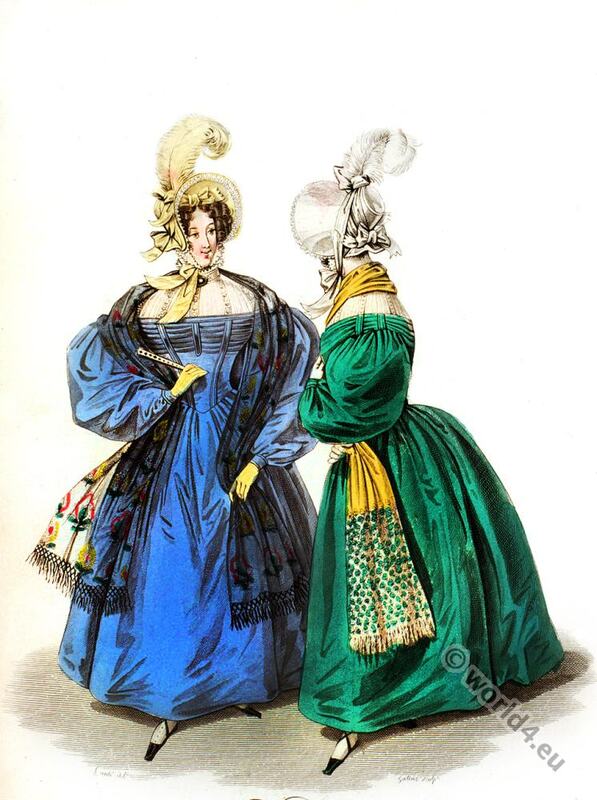 Yet I must mention the “Taglioni gowns,” consisting of four skirts; nor can I omit speaking of “berthes” of blond, “Célimènes,” Pompadour bodices, Niobe lacings, plaitings “à la Vierge,” Grecian and pointed bodices, &c.
Numberless new materials were produced; among them were “droguet Catalan,” “lampas burgrave,” “Polar star,” “blossoming chameleon,” “casimirienne,” “palmyrienne”— a blue ground brocaded with gold, “Benvenuto Cellini” blue velvet, “Medici” and “Louis XV.” satins, “tulle illusion,” “Rachel” crape, “cameline” silk, a tissue called “fil de la Vierge,” “polka” gauze, and, lastly, “Duchess” and “Fleur de Marie” pocket handkerchiefs. In 1839 a manufacturer invented “sylvestrine,” a material composed of the thinnest possible layers of wood; these formed the surface of a light and flexible sheet of pasteboard. Another invented a material of spun glass. Great ladies delighted in lace. The wedding gown of the Princess Helene, Duchesse d’Orleans, was of Alençon point, and cost thirty thousand francs. 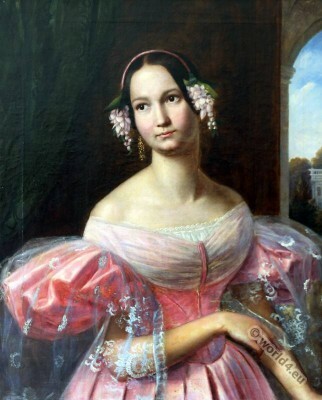 Hélène de Mecklembourg-Schwerin, duchesse d’Orléans (1814 – 1858) on 30 May 1837 as bride at Château de Fontainebleau. Married to the successor to the throne Prince Ferdinand Philippe, Duke of Orléans (1810-1842), eldest son of the last French king Louis Philippe and his wife Princess Maria Amalia of Naples and Sicily. 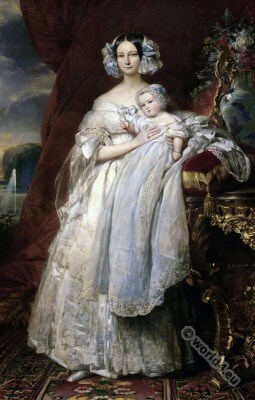 Hélène de Mecklembourg-Schwerin, duchesse d’Orléans with her son Louis Philippe Albert, about 1839. Portrait of Franz Xaver Winterhalter. How many different names have since then appeared in the Calendar of Fashion! Each recurring season has witnessed the birth and death of something new in head-dresses or dress materials, or some fanciful caprice or new shape in garments. The beautiful Mmc. 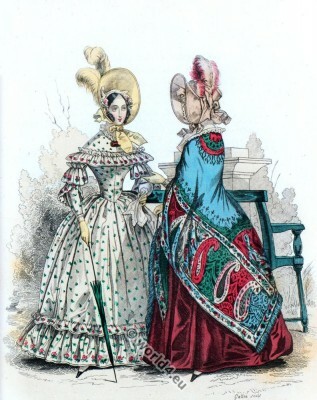 de Sampajo, the attached friend of Louis Philippe and his family, was enumerating, on one occasion, all the costumes she provided herself with at the beginning of each year. 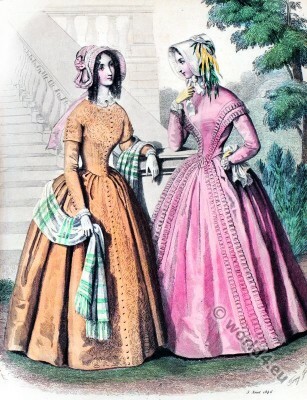 It is a fact that regicides abounded under the Monarchy of July; and as often as Louis Philippe escaped unhurt from some attempt on his life, ladies would hastily dress themselves in some simply shaped, dark-coloured costume, and present themselves at the Tuileries, to offer him their congratulations. 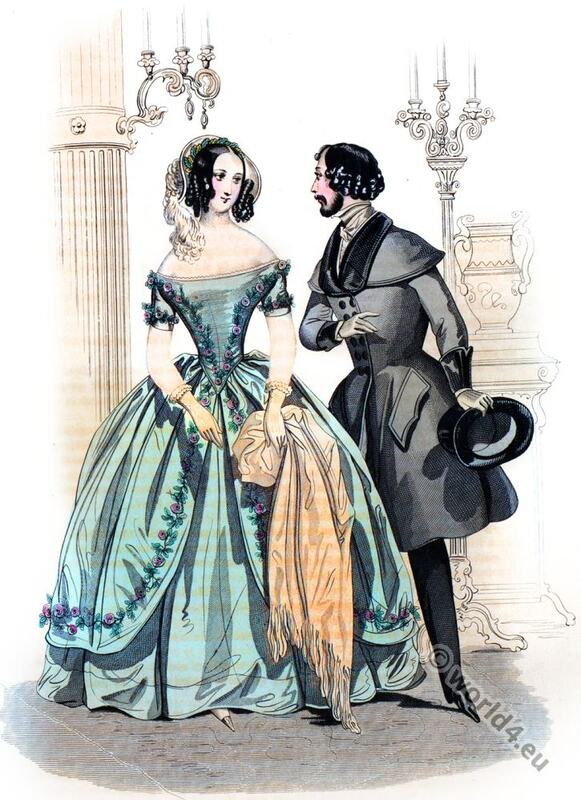 In the annals of fashion, the reign of Louis Philippe is remarkable only for “romantic costume” at first, and afterwards for the “classical costume” inspired by Rachel. It must not be inferred, however, that the reign of Fancy had ceased to exist. Many trifles, light and fragile as roses, exist like roses, for one day only. And every woman is the willing slave of Fashion, however extraordinary it may be, so that by dressing like others, she may avoid the appearance of singularity. 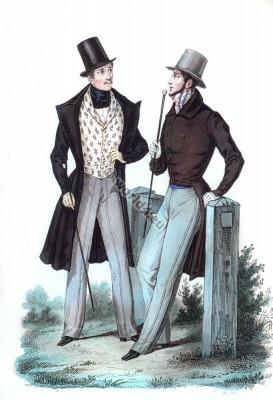 A sort of rivalry existed in 1834, concerning bouquets for balls. Five or six camelias, mixed with green leaves, were placed in the centre of a pyramidal nosegay consisting of violets, ferns, and small hot-house flowers. These bouquets were placed in a gilt or jewelled holder, to which was attached a ring and chain; the bouquet, therefore, might be allowed to fall, and would yet remain suspended to the finger. La Mode. Journal et gravures des mode. Bibliography of costume. Restoration period. Romanticism. 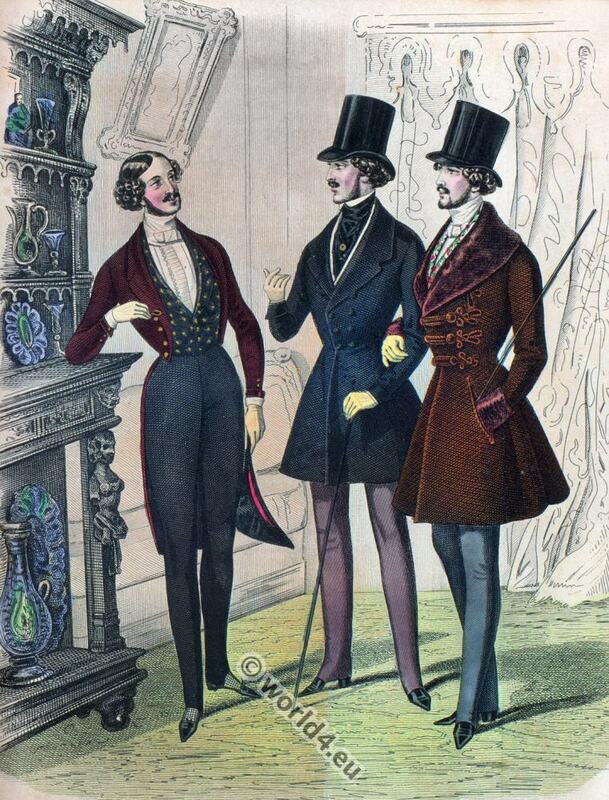 Early Victorian era. 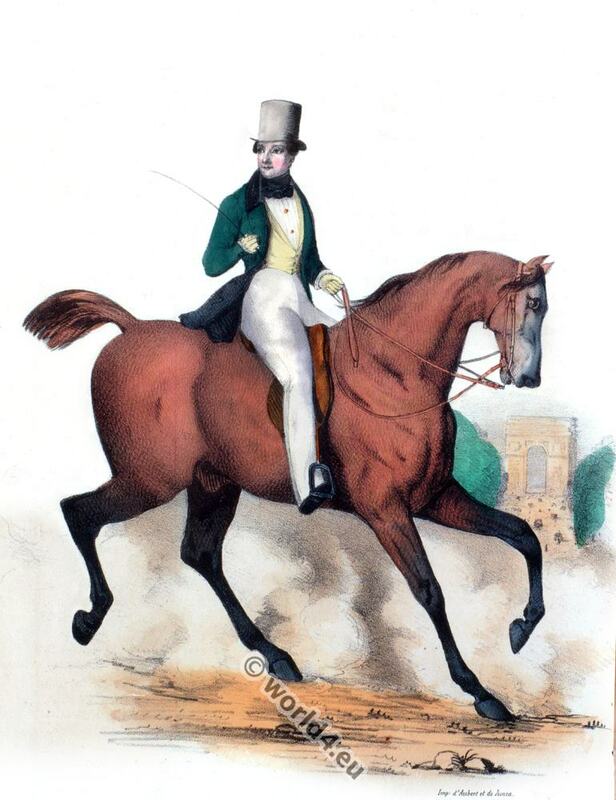 German Biedermeier.